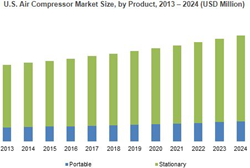 Global Market Insights, Inc., quotes centrifugal air compressor market will cross USD 35 billion by the end of 2024 to capture close to 40% of the entire compressor industry share due to extensive industrial applications which need high capacity and larger discharge rates along with long run compatibility as the product needs very low maintenance. Top key players mentioned in this air compressor market report include Atlas Copco, Ingersoll Rand, Hitachi, Emerson, Gardner Denver, ELGI EQUIPMENTS LIMITED, BAUER COMPRESSORS INC., MAT Holdings, Inc., Doosan SA, VMAC, Vanair, Sullivan-Palatek, Inc., KAESER KOMPRESSOREN and more. The report by GMI predicts APAC air compressor market will surpass US$ 5 billion by the end of the forecast period due to increasing home appliances and electronics demand in the Asia Pacific region along with its increasing usage in refrigeration systems, air conditioners, and other appliances, the worldwide air compressor market is set to cross USD 40 billion by 2024.